Description: Miniature map of Kansas set within a vignette showing a farmer tilling a field. Printed colour. 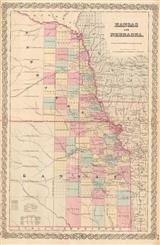 Description: Large railway map of Kansas, with reference panels on outer edges and colour key by title. Printed colour. Description: Large map of Kansas divided and coloured by county. Railroads are marked with red numbers according to a legend in the lower-left corner. Printed colour.